For those of you that are interested I have been conducting some tests using the MK802 as an everyday desktop computer. As some of you know I have my MK802 connected to a Motorola Atrix Lapdock which allows it to be used as a very small notebook. Whilst Android works nicely on this setup it is optimised for media and touch screen navigation and I was looking for a way to use the MK802 more like a desktop computer, it has impressive specs so why shouldn't it work? Being a day to day mac and Linux user I crave snappy reliable performance, free open source software and neat hardware. When I first discovered the MK802 it really interested me as I saw the possibility of a useable desktop platform that could offer great performance for everyone whether they hook it up to a small monitor or a 50" TV! This was one of the driving forces that led me to create these forums. The MK802 has created such a massive amount of interest in the developer community and there's some really great work been done already to get different operating systems running on the device. I have been following this closely and providing input where I can to push this along. Anyway my tests so far have been conducted on a 1GB MK802 running Xubuntu 12.05 with the XFCE desktop (image courtesy of Miniand) and Kernel 3.0.8+. This is a medium weight build and it runs quite well considering its early days in the development phase. (2 weeks ago we only had access to an Ubuntu 10 image which was originally intended for the Mele A1000 media player). Things are moving really fast! There are a few different distro's knocking around but this is the one I have settled on so far as it offers the best in terms of performance, graphical appearance and usability for newcomers. 1. Using the 3.0.8+ Kernel Xubuntu boots from cold to login screen in 35 seconds. 2. Once booted and disk access has calmed down file manager launches in a few seconds, if you launch it again after that then its instant. 3. Chromium lanches in 5 seconds. 4. 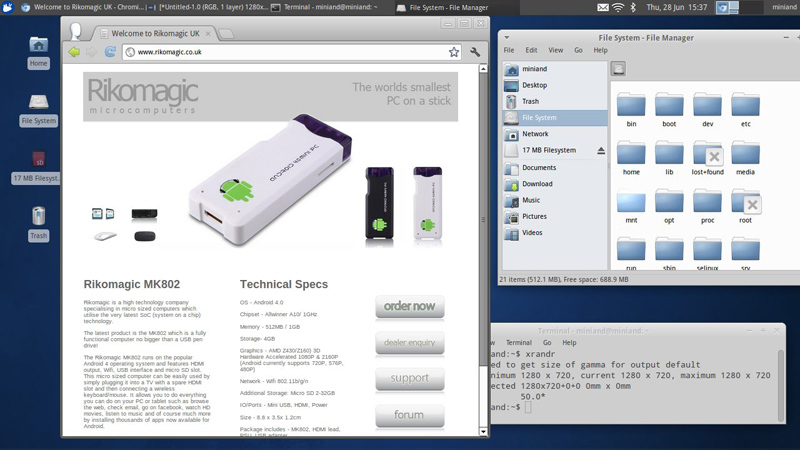 Chromium browsing is flawless, not quite as snappy as my Macbook air but that has an i5 and cost £1K !! 6. Currently my sound config is buggered, I found it works on the other Linux distros including the full Ubuntu (GNOME) and Fedora. It is just something to do with Pulse audio and it can be fixed with some fiddling. 7. Battery life when using this setup with the lapdock is about 4 hours v.light use, by this I mean I left the machine running and let the screensaver activate and then periodically did some web browsing and installed a few apps. 8. Screen resolution i am using is 1280x720, I have tried 1920x1080 and it works but it does slow everything down. 9. The only game I have tried that requires any horsepower is "cut the rope" running in Chromium browser and it runs but very slowly, the game even said "your computer is running slowly!" which made me laugh. That said many of the other apps from the Chrome store work very well which makes this setup even more appealing. To summarise I, at the moment I would say this particular configuration is quite useable and once we can get some more Kernel modifications and proper support for the GPU built in then we will be onto a great little package that allows cheap, reliable desktop performance. With regards to heat, it's fine now but when the GPU has proper support we might have to watch it. Under android it can get warm but I have left my early sample streaming video for quite a long stint and there's been no issues so far. If anyone is interested in trying this setup I'll create an image for it and you can burn it to your own SD card. Here's a shot of my desktop, I screengrabbed this on the Mk802 using the built in image editor "Gimp". How is the performance of the Office suite in Ubuntu? Of course, USB flash drives will always be faster; but I have seen no accounts of a USB boot from any of the MK802 type systems. Currently working on my Master's Degree in Mechanical Engineering with Specialty in Mechatronics. The speed class ratings of SD cards are rated for sequential writes of big media files, video, hi-res photos. The type of performance needed for booting an OS is completely different, random access read/write speed is critical. You might find that a Sandisk Class 2 card is much faster than an amazon Class 10. Me and you are on the same wavelength! I just started my search for the fastest SD card but then found loads of info on the PI forums on the subject. That's interesting stuff over at XDA so it seems we need a card that is exceptional at Small Block Random Writes. I think it is possible to run the filesystem from a usb stick, you would have to uboot from the SD card, load the Kernel and then mount the USB stick with the filesystem on it. t-bon3 wrote: How is the performance of the Office suite in Ubuntu? I would say its useable, Gimp runs nicely. I've just done a video to show the general performance of the system, its processing now (not on the MK802!) it'll be uploaded shortly. andykirby wrote: I think it is possible to run the filesystem from a usb stick, you would have to uboot from the SD card, load the Kernel and then mount the USB stick with the filesystem on it. It's been a real long time I've run LINUX in anything but under Parallels on a Mac, but I seem to recall some boot loader thingie (don't believe it was grub but maybe it was later version of it, again it's been a real long time) which basically did a kickstart and then the boot device (SD card in case of MK802) was not touched at all, hence would allow not only flashdrives but all USB HDDs, etc. ?? Would be nice if you can post your image here so I can try this. Have the 1GB here. /Grtz from The Netherlands. Have a MK802+ (white model with the holes in the bottom). 1GB. I have no doubt that the MK802 can boot from the USB since the AllWinner A1X specs allow for USB boot, however the firmware is currently lacking the ability. I have acquired my SD cards and Ubuntu so far has been great, I'll be running tests on multiple operating systems that currently work on the MK802, I'm hoping Chrome OS boot will avalible soon, I know they got it working for the Raspberry Pi so it should be out soon.